Gemeinschaft or community was defined by German sociologist Ferdinand Tönnies as a tight and cohesive social entity with the presence of a "unity of will." Tönnies also believed that shared characteristics, such as geographic place or belief, could also result in Gemeinschaft. This paradigm of communal networks and shared social understanding has been applied to multiple cultures in many places throughout history and was certainly descriptive of the German colony of Norka. These immigrants originated primarily in what is now the modern day country of Germany. Freed from the constraints of a feudal society, they faced the daunting task of creating new communities in a vast and unfamiliar land that they shared with other ethnic groups. This group balanced a complex tension between their hunger to leave the past and their hunger to retain it. In the process, a disparate group of colonists formed a new identity and homeland within the Russian Empire. 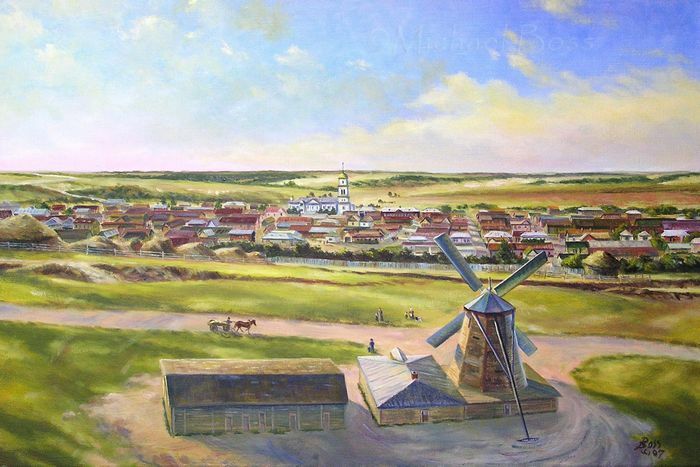 Painting of Norka, Russia by artist Michael Boss. Courtesy of Steve Schreiber.